In the wake of recent air strikes on Syria by the United States and its allies, some lawmakers in Washington and other world capitals are questioning the attacks’ legal basis. The Trump administration claims the recent assault was justified, but it has not laid out a rationale based on international law, says CFR’s John Bellinger, legal advisor at the National Security Council and the State Department during the George W. Bush administration. This leaves the United States open to charges of acting lawlessly and inviting similar behavior by other countries, he says. The United Kingdom is the only government that has explicitly said its use of force comports with international law, citing humanitarian grounds. When the United States conducts a military strike such as this one, the White House looks to demonstrate that the use of force is permissible under both domestic and international law. How is the Trump administration framing these strikes from a legal standpoint? President Trump himself has not addressed the legal basis for either the strikes on Syria last year, on April 6, or those this past Friday, April 13, in any of his oral statements. Trump administration officials have not cited any international law basis for the April 2017 or April 2018 strikes, and it would be difficult for them to do so. The UN Charter specifically prohibits a UN member state from using force against another member state except in self-defense or if authorized by the Security Council. In a statement to the Security Council on Saturday, U.S. Ambassador to the UN Nikki Haley defended the recent strike as “justified, legitimate, and proportionate,” which is carefully chosen, quasi-legal language suggesting that Trump administration lawyers concluded that the use of force could not be characterized as lawful under international law but was still appropriate on the basis of the specific facts in Syria. The Clinton administration adopted the same approach when it cited a number of factors as justifying U.S. air strikes against Serbia in Kosovo, without claiming that the use of force was legal. Why does the legal rationale matter? There looks to have been considerable debate within the administration over launching these strikes, ultimately deciding to go with a more restrained response. What do you make of the proportionality question? The April 13 strike was obviously quite limited. It’s not clear whether this was for a policy reason, i.e., to avoid provoking the Russians or Iranians, or for a legal reason, i.e., to allow the United States to claim that its use of force, even if not consistent with the UN Charter, at least met the customary international law requirement that any use of force be proportional to the threat. To what extent does the Trump administration’s legal rationale diverge from that for last year’s attack? The administration has relied on the same domestic law basis for both strikes, i.e., the president’s inherent constitutional powers, rather than any congressional authorization. Although the administration has not (and probably could not) offer a clear international law basis for either strike, Ambassador Haley’s statement that the most recent strike was “justified, legitimate, and proportionate” appears to be an effort, perhaps urged by administration lawyers, to provide an international law justification. How are the United Kingdom and France handling the legal questions? The United Kingdom appears to be the only one of the three governments who participated in last week’s strikes to state explicitly that its use of force was lawful under international law. The French government does not appear to have specifically addressed the legality of its use of force. Under UK law, the British government may not use military force unless it has concluded that the use of force is lawful, including under international law. To participate in the strikes, the British government was therefore required to conclude specifically that its use of military force was permitted under international law, not simply justifiable. The United Kingdom is one of the few countries in the world to recognize a legal right of humanitarian intervention. The British relied on this doctrine as the basis for their participation in the 1998–1999 Kosovo bombing campaign, and the [David] Cameron government said in 2013, at the time that Britain was considering intervention in Syria, that international law recognizes a right of humanitarian intervention. The U.S. government, like most other governments, has never accepted that international law recognizes a right of humanitarian intervention. 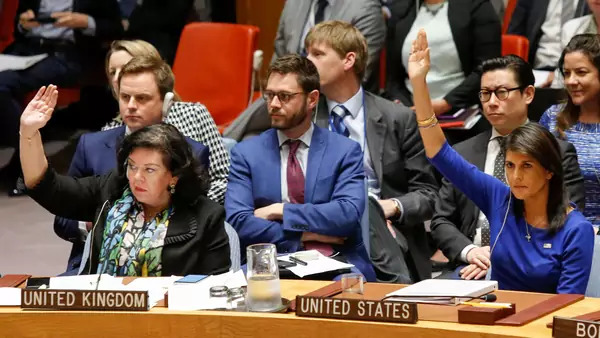 The UN Charter does not authorize the use of force for humanitarian purposes, and successive U.S. administrations have concluded that recognizing such a right might create a precedent that could be abused by other countries. Some U.S. lawmakers, such as Senator Tim Kaine (D-VA), have labeled these and past U.S. military strikes against Syria as illegal because Congress didn’t authorize them. What are your thoughts on this debate? It is always preferable—for both legal and political reasons—for a president to have congressional authorization for any use of force. That said, the president clearly has broad constitutional authority as chief executive and commander in chief to order the use of military force to advance important national interests. As I explained in my Senate testimony in December, presidents from both parties have deployed U.S. forces and ordered the use of military force without congressional authorization on several occasions. The Department of Justice’s Office of Legal Counsel has written numerous opinions, under both Republican and Democratic presidents, determining that the president has the power to commit troops and take military actions to protect a broad array of national interests, even in the absence of congressional authorization, including for the purpose of protecting regional stability, engaging in peacekeeping missions, and upholding UN Security Council resolutions. In this case, although there were certainly policy arguments for and against U.S. intervention in Syria, there was a compelling U.S. national interest in preventing and deterring Syria, as well as other governments, from using chemical weapons against its citizens.